Do you ever look back wistfully and wonder what the younger you would have made of your life since? 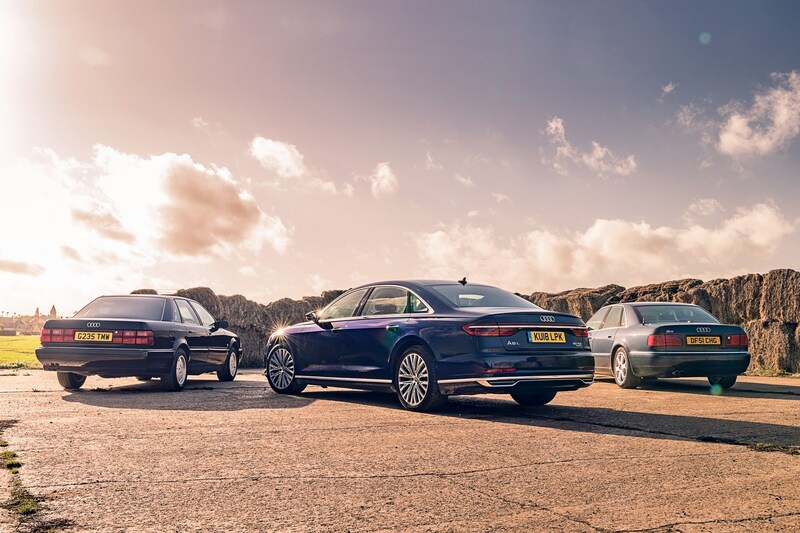 We've been doing a bit of that with our departing Audi A8, Audi's traditional range-topper, which in recent years has been joined by more modish Q and R models as Ingolstadt's expansion plans run riot. 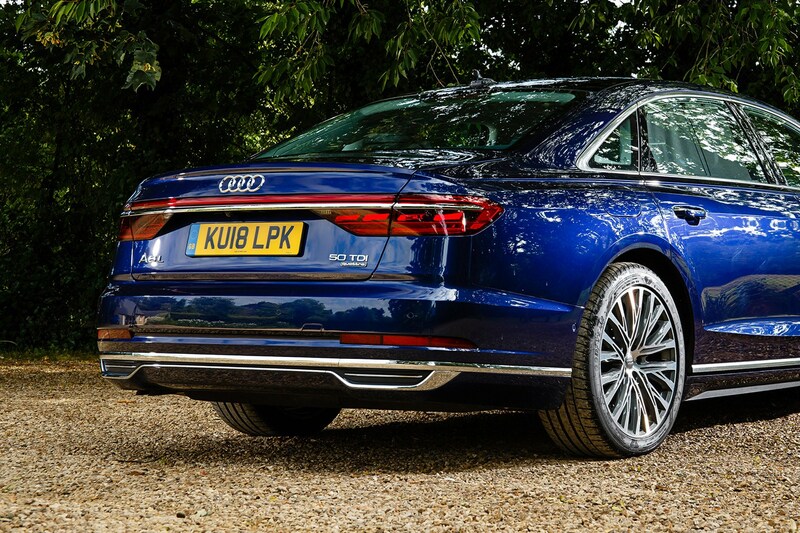 Where does this leave the A8, with its regal but sober three-box-saloon silhouette? To find out, we enlisted the help of its forefathers. 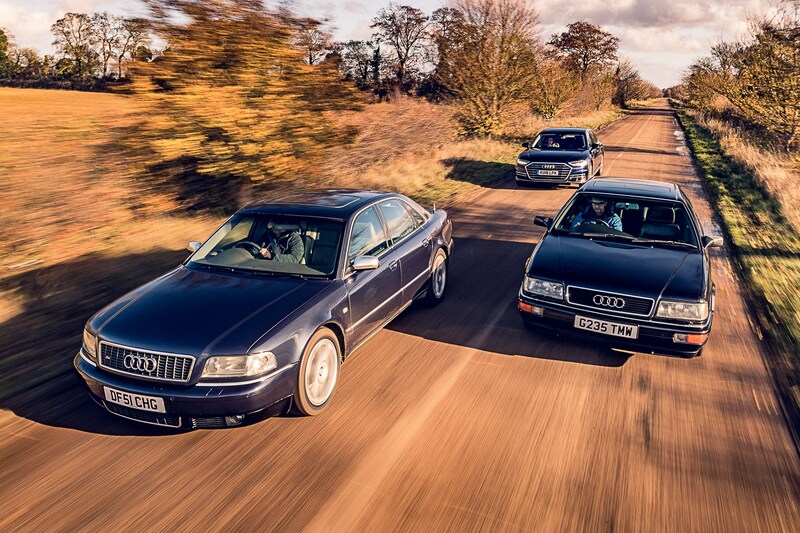 The template for today's four-door Audi range was arguably set three decades ago by the V8 saloon that launched in 1988. It took the sleek aerodynamicism of the 100/200 range and added a promising 247bhp 3.6-litre V8 motor, all-wheel drive and a battery of technology to tempt City folks and country squires away from their Jag XJs, Merc S-Classes and BMW 7-series (the Lexus LS didn't reach Britain until 1990). The V8 was Audi's application to the big boys' premium club. 'The V8 moves Audi into new territory and the technological advances on offer mark a genuine step up from the 200,' CAR opined when we first drove it 30 years ago. And having driven the superlative example from Audi UK's heritage fleet, we're inclined to agree. It wears its 104k miles lightly and the bloodline reads like a Darwinian historical document: sleek aero details abound (check out the lack of rain gutters and the breeze-cheating blades on the windscreen wipers) and there's a techy vibe throughout, entirely consistent with our 2019-era A8. Mini headlamp wiper blades and the laughably old-school Electronic Climate Control bolt-on at the bottom of the dash remind us that Vorsprung durch Technik has been around a long time. Open the thin, lightweight doors (barrel-lock keys! Physical levers rather than electro-handles! Recalcitrant alarms!) and you're greeted by an interior straight out of the 1980s. It's a simpler aesthetic, with only rudimentary electronics on display and most surfaces covered in cheap shiny black plastic and dark walnut, your eye drawn to a 170mph speedo and a fuel gauge calibrated to 80 litres. This cabin was on the cusp of the technological revolution that's transformed cockpit from lounge to laptop in 30 years. At 4874mm the original Audi V8 is shorter than today's A6, let alone the A8, and its modest footprint shows in packaging that borders on mean for a luxury car. Rear seats are cramped and the driver's hand is pinched when you reach for the electric seat switches. Then you start driving and are transported back to a different era – one where dainty steering wheels are uncluttered by buttons, where passive ProCon Ten safety kit takes charge in a crash rather than active electronics. Performance is sluggish, the steering woolly and its 9.2sec 0-62mph time would today barely qualify for warm-hatch status, but it's still a lovely car. The V8 is laid-back and lazy, the modest 215/60 Firestones preferring a gentle waft to a hard charge, and ride quality is pleasingly compliant, soaking up bumps and lumps with cushioned ease. In this regard, there's a direct link to the character of our departing A8. The original is something of a Q car, with no V8 badging on the anonymous rump. I'm left concluding that this was a sneaky, smart way for Audi to nudge upmarket. 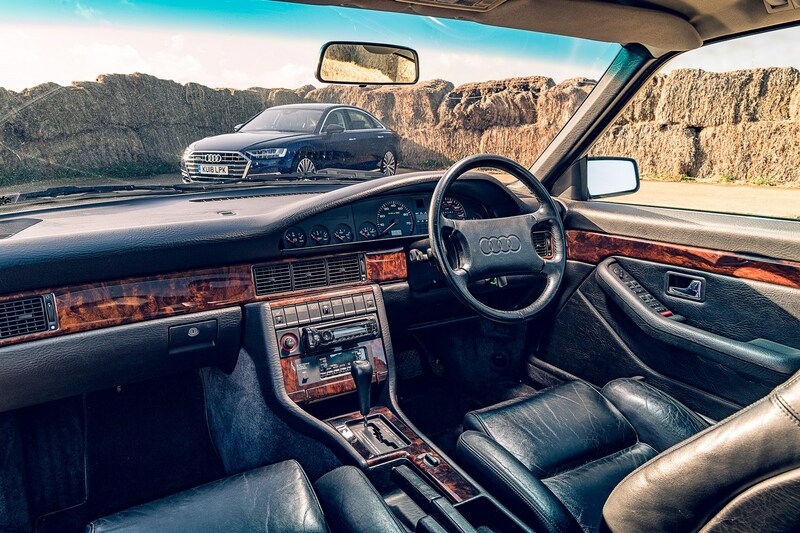 The V8 begat the first-generation Audi A8 (codenamed D2) in 1994, and we borrowed its brawniest iteration – the sportier S8 of Ronin fame – to see how it stacks up against our modern-day D5 long-term test car. The S8 is lovely, even with a leggy 155k on the clock. It feels more recognisably modern, with a 21st century VW Group flick-action key and those little red dot matrix read-outs that feel at once ancient and reassuringly familiar. Our 2019 model's almost total banishment of physical buttons and a whizzbang smartphone-inspired haptic touchscreen are a reminder how much change has been squeezed into so little time. The S8's tilting sat-nav screen, outdated mapping and hilariously bulbous GPS receiver stuck on top of the bootlid confirm the tech conveyor belt is speeding up. Obsolescence is just an update away. Packaging improved thanks to the S8's overall length stretching to 5041mm, still 12in short of our contemporary 5.3-metre-long A8's footprint: it's roomier than the V8 in the rear, but lacking the echoing lounge effect of today's space capsule. Mind you, all three generations betray their quattro lineage with huge transmission tunnels bisecting the rear seats (not a problem with modern electric rivals) and all have privacy blinds on the rear windows. The S8 is quite a thing to drive – while interiors and technology have progressed at a pace, the 355bhp 4.2-litre V8 engine is winningly engaging and effective, even today. Audi quoted 6.6sec 0-62mph and 155mph full whack for this auto (the rare manual dropped to 5.4sec; the 180mph on the speedo is bragging bull) and it feels rapid today, spearing the aluminium four-door down the road with pleasing alacrity. You can shuffle the transmission using the counter-intuitive button shift on the steering wheel, but the S8 also wafts in style when you back off, those 245/45 ZR18 Kumhos soaking up the imperfections of the blacktop when you stop pretending you're drifting around Parisian junctions. Over 8000 miles in our A8, nothing went wrong, fuel consumption averaged 37mpg and we preferred a hushed cruise to a hurried hustle. It's telling that there's no S8 in the current range and it's probably right that the emphasis has shifted from sportswear to suited and booted. Again and again throughout my six months with the Audi, CAR staffers would sidle up to my desk, mentioning an impending long drive to the coast for a weekend away, and wondering if the A8 might be available. The A8 aces this kind of trip, the ones where you can enjoy the full luxury experience of mechanical peace, double-glazed quiet and seamless digital integration. The conservative, under-the-radar style is another big Audi constant whose subtle appeal should not be underestimated. I've never lived with such a big car for an extended period before and found the supersized Audi difficult to bond with. 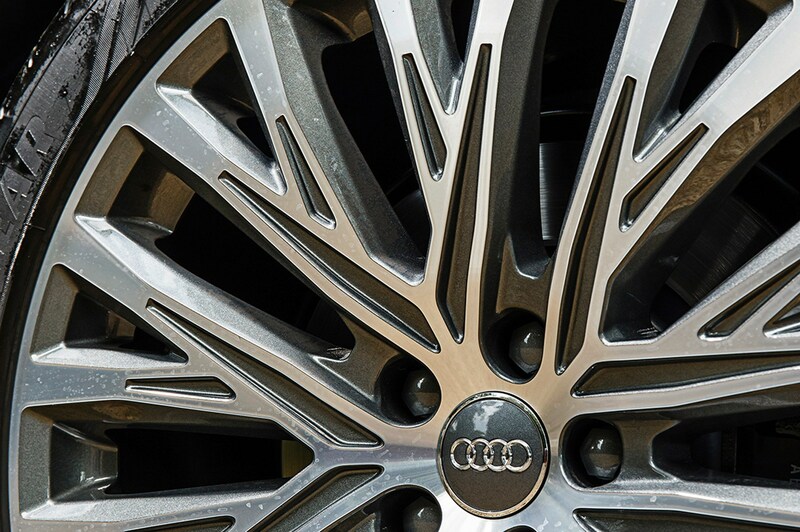 Yet there's no denying the clever engineering skills and the cabin-crafting talent involved in the A8. From behind the wheel, it shrinks around you, four-wheel steering making it nimbler than that two-tonne weight suggests. If you're not a chauffeur, a captain of industry or a hotel, would you even be considering a £93k limo? The class below – the A6 and its rivals – has evolved into a style of car that can cruise almost as elegantly as an A8, but with slightly less size, weight and expense. But even the A6 is swimming against the zeitgeist, which is all about crossover creds. 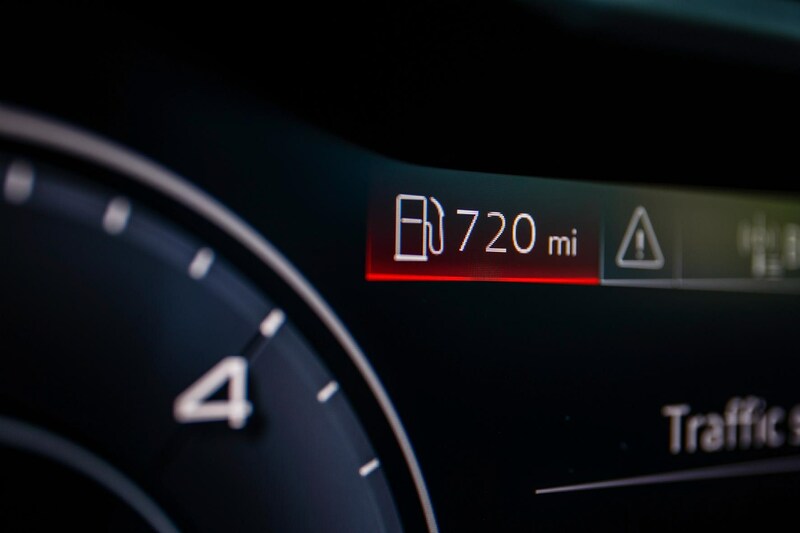 The list price may be less of an issue if you're leasing rather than buying, but somewhere along the line someone will have to foot the bill for the terrifying £5-a-mile running costs (when you factor in the startling depreciation). Meanwhile, its diesel powertrain feels on the cusp of being overtaken by the waiting e-Tron electric revolution. 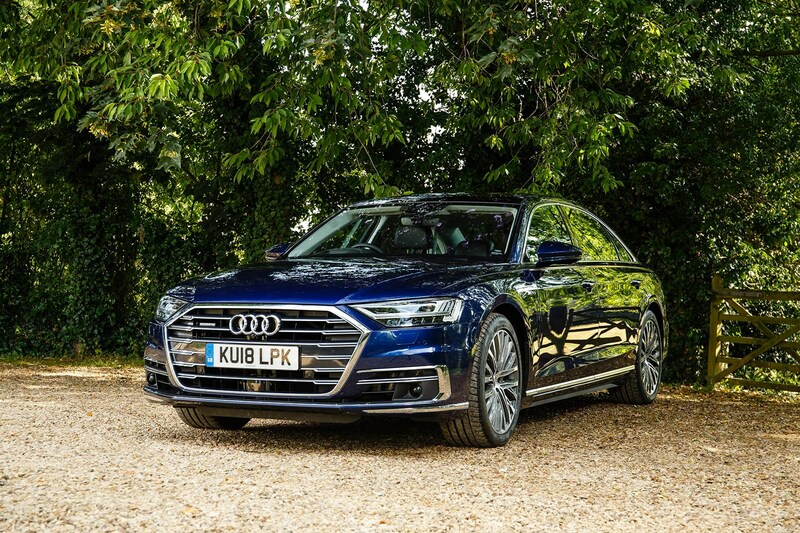 The Audi A8 is one of the most technically advanced cars on sale and wears enough TLAs to whip Gadget Show types into a frenzy. Mercifully, it also lets you jump in and just drive, should you prefer to shun techno trickery. No key required, press the start button, tug the chunky joystick gearlever into D and off you schmooze. But to drive the A8 in this fashion is to miss the point. It’s dripping with microchips. Where to start? 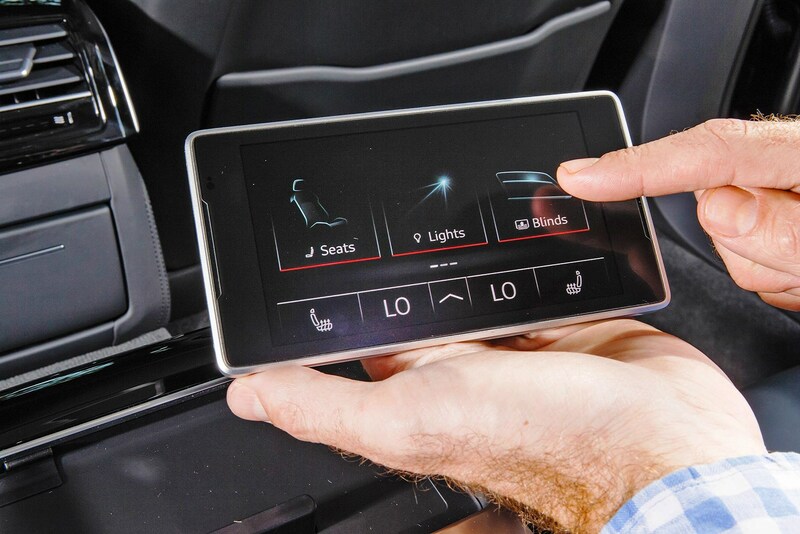 Usually with MMI Touch, the haptic touchscreen that replaces most switchgear. It’s disconcerting at first – the screen fizzes when you prod buttons: the virtual becomes visceral. Gliding your finger to swipe and write addresses is simple and effective. Voice control is improving, but still misconstrues too many of my mutterings. Audi Virtual Cockpit lets you display dials, nav and infotainment, and the A8 syncs seamlessly with every phone we’ve tried. 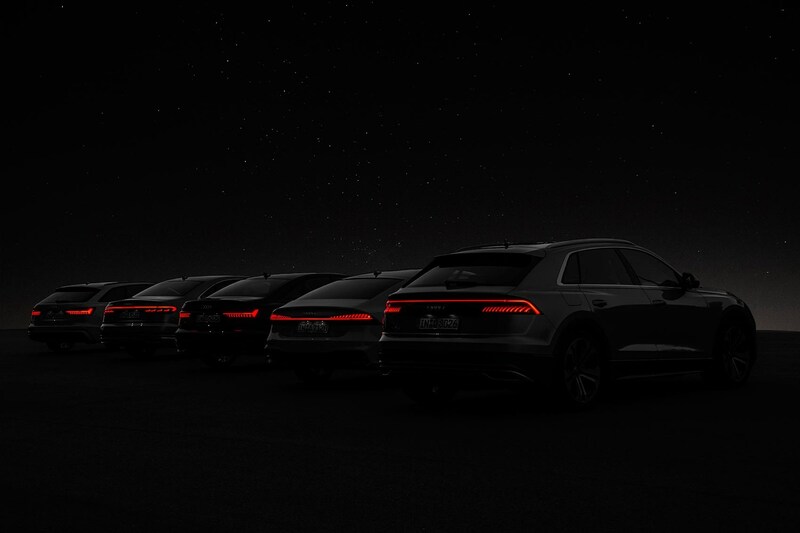 Special mention also to the Audi Laser Lights, whose piercing glow comes into its own at this gloomy time of year. What of its semi-autonomous tech? Much of the A8’s Level 3 self-driving toolkit lies dormant while legislation catches up; after spending half a year being driven by a Tesla Model S, Munich’s autopilot is a step back. Our 50 TDI feels untapped, straining at the leash to drive itself. We’re truly at a technological crossroads. What a big gob! That's the Audi A8, not me. 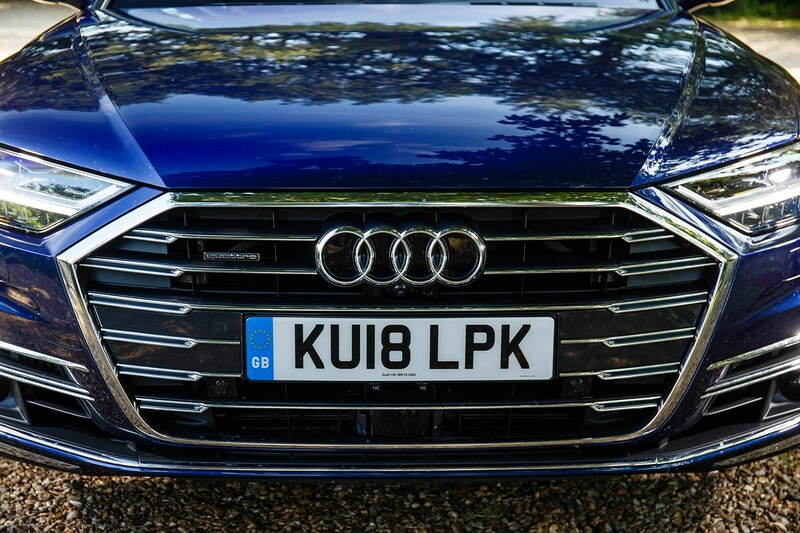 I've never fully understood this obsession with super-sized grilles, but our A8 certainly has one. The trapezoidal front end has grown ever bigger in recent years and it's now 119cm wide and 47cm tall, peppered with cameras and radar sensors. Yes, this beast from the deep can see through its mouth. This is a big car, measuring 5302mm long, 1488mm high and 1945mm wide, or 2130mm with mirrors. I've never understood why manufacturers quote width without mirrors; it's not like you can remove them before squeezing through a narrow gap... (Though squeezing through may remove them.) I prefer the elegant styling at the rear to the rather over-the-top face. 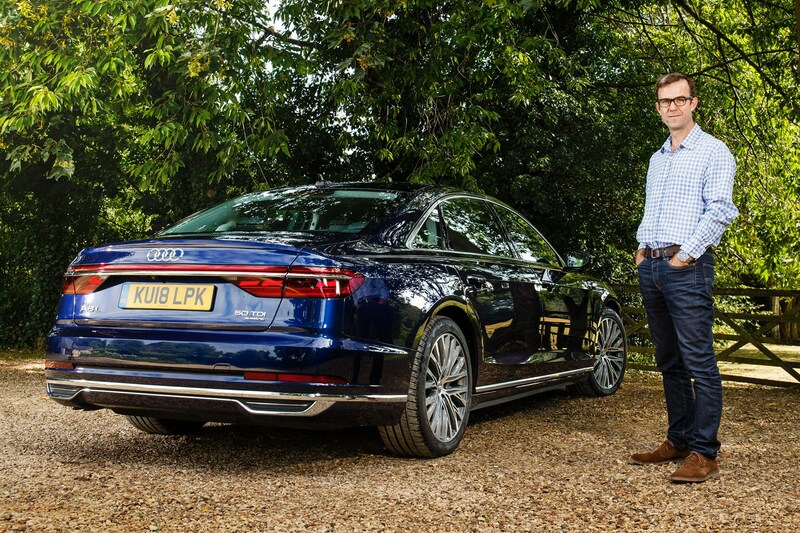 Our A8 rolls on these rather unusual – and pretty – 20-inch, 20-spoke, contrasting grey, partly polished alloy wheels. Turns out they're rare, too: Audi has now discontinued them. Perhaps the £3100 cost of this option put people off. They're shod in grippy, quiet Goodyear Eagle F1 tyres, whose vital stats are 265/40 R20. Seven hundred and twenty miles. That’s the range of our A8 when you brim its 82-litre tank. Enough to drive from London to Milan. Seems unlikeIy? In mixed driving, we’re averaging 37mpg. But get it on a motorway and the A8 shines. The ride is cushiony, the stereo sublime, the seats supportive and soft – and fuel consumption regularly tops 44mpg. For a two-tonne, 5.3-metre, all-wheel-drive limousine, this is nothing short of remarkable. Diesel’s not done quite yet. 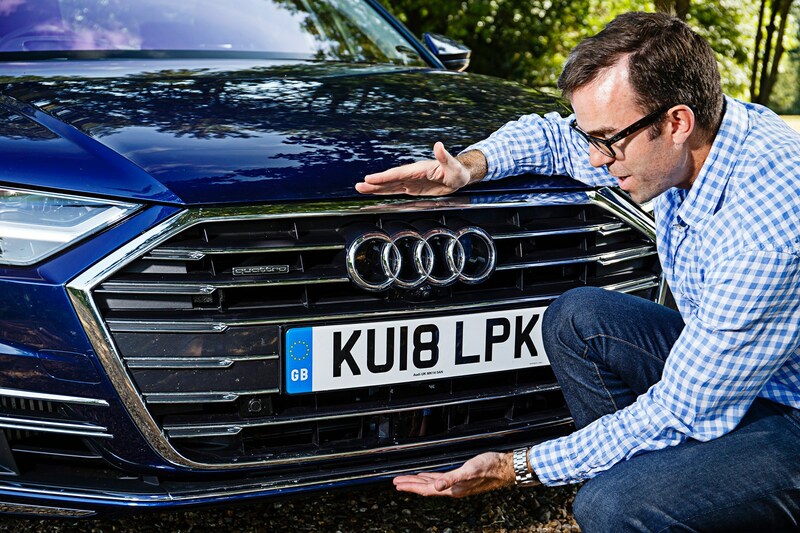 Diary update: should you pay £4900 for Audi's HD Matrix LED headlights? 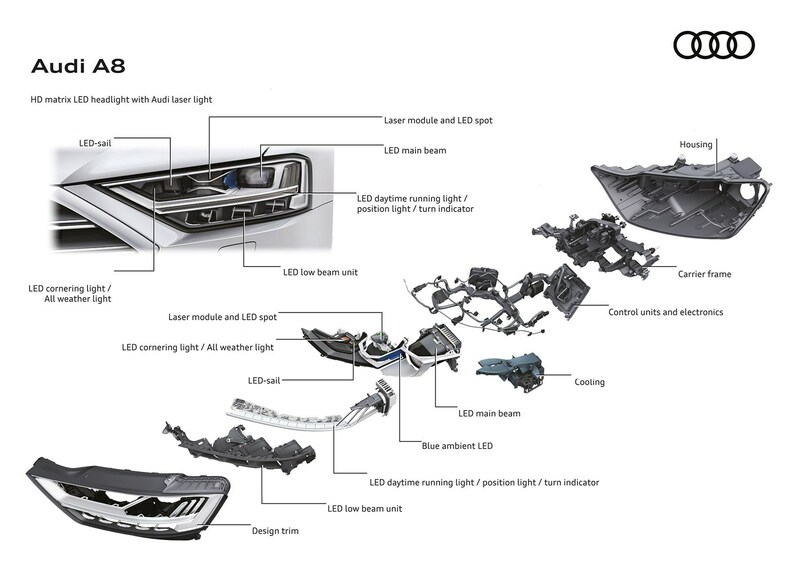 As gloomy nights creep in, stealthily extending hours of darkness, it's a good time to analyse the the Audi A8's most expensive single option: the £4900 'HD Matrix LED headlights with Audi Laser Light and OLED rear lights,' to give them their full description on the spec sheet. Five grand for fancy lights! Is this a bright idea? Now I've always said that as a rural country dweller that I would pay to upgrade my headlamps for better visibility at nighttime. But this does seem a large amount to sign off - although in fairness, modern financing means the hit would be in tenners per month, not hundreds, when baked into a long-term lease or PCP. A few of you commented back about the needless complexity and long-term reliability concerns over these complex units. Will you be able to replace a bulb if it goes? No. Is this potentially storing up big bills in future? Time will tell. You could level the same accusation at most new electro-advances in the automotive industry; it's fair to say the days of simple, repairable cars are rapidly receding. The lights at the front are equally clever. 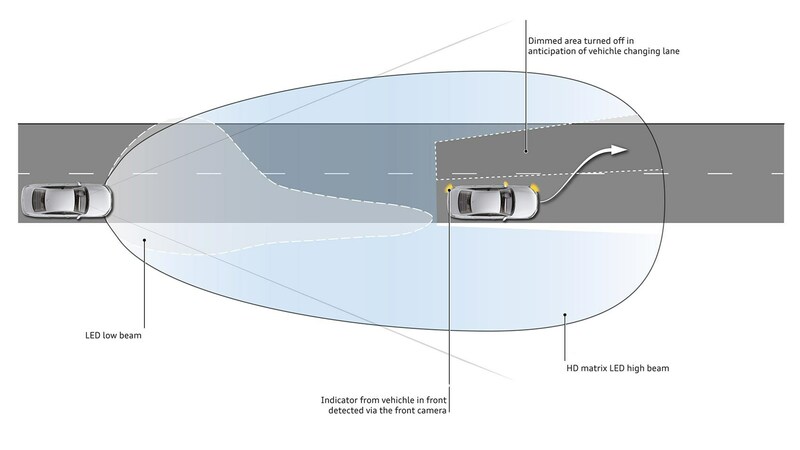 Flick them on to full beam and the algorithms take over, flicking up and down to full beam with no manual assistance, staying fully illuminated but shuttering off individual LEDs to avoid blinding oncoming traffic and bending to read the road ahead. They're mighty impressive and the tech has improved to such an extent that I don't remember any occasions this winter where I've been flashed by other drivers for having full beam on. This would happen on occasion when the tech was nascent (funnily enough on another Audi, my old TT S long-termer). Perhaps the A8's lighting party trick, however, is the Laser Light technology. When speeds rise above about 40mph full beam is assisted by lasers in the main lighting unit, piercing the dark ahead for what looks like a full mile. It's uncannily clever and uses sat-nav data to predict what's ahead. Audi claims it nearly doubles the range of the lights and the extraordinary reach - and shaping - of the main beam does a good fist of that old cliché, turning night into day. When the cool Laser Light logo comes on the dash, you know you've got the best chance of seeing obstacles or animals in the road ahead for hundreds of metres ahead. I'm still not convinced I'd spend the thick end of £5k on this tech, but they're about as sophisticated lights as I've seen on any production car. I’ve never lived with anything bigger than a 5-series for an extended test so it’s taken a while to get used to having a 5.2-metre luxury leviathan on my driveway. Gaps have to be judged more carefully and country lanes approached with circumspection, and my family is resigned to me parking in the largest, most remote bays of car parks. It spills out of most spaces like an overweight passenger sprawling beyond the confines of an airline seat. The flipside is that we have oodles of space inside. My children can’t quite believe the legroom in the rear of our long-wheelbase A8 L, complete with the comedic little footrest blocks nestling in the rear footwell. I’ve spent most of my time up front, where it’s equally roomy, but the rear compartment is where the Audi flagship makes most sense. 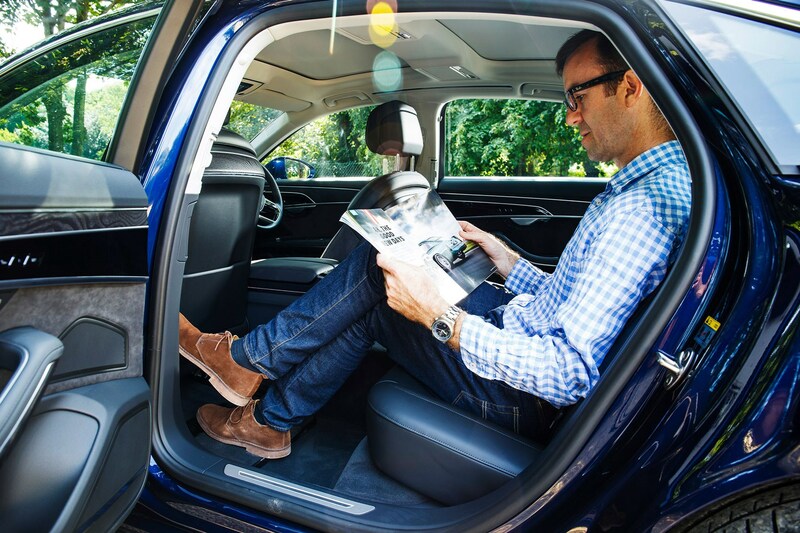 Our car comes with the Rear Comfort Pack which bundles in those footrests, double glazing, electric rear seat adjustment and power door-close for a chunky £2195. 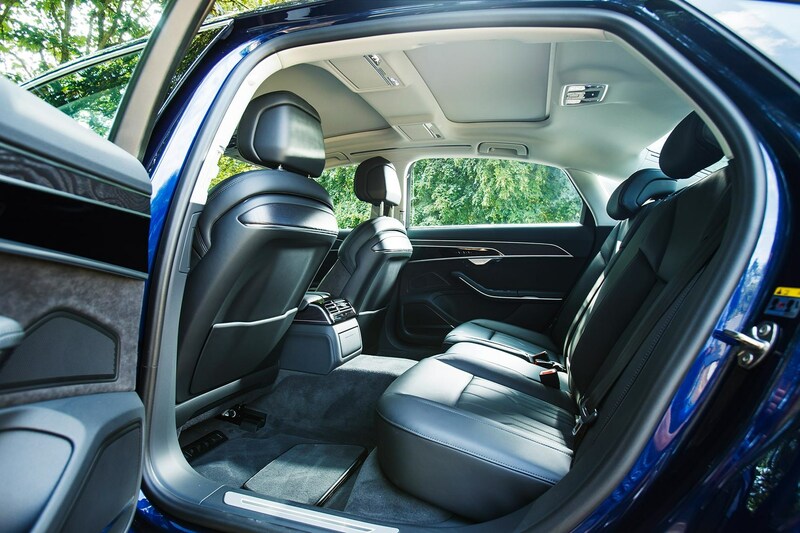 The acoustic glass makes the A8 recording-studio hushed, and the large fold-down armrest lets you choose between four-seater limo spec and occasional five-seat taxi duty. Note also the removable micro-tablet in the armrest; back-seat drivers – sorry, passengers – can use it to adjust temperature, check the trip computer or even re-tune the stereo. Parents should note the potential for familial chaos on long journeys, as infotainment control is inevitably ceded rearwards. It’s not all about the newly-entitled passengers in the back, though. Up front I too have become accustomed to sitting in the lap of luxury thanks to the extremely comfy armchairs. There are no massaging or ventilating tricks here, but these are inherently well designed, pampering pews. Is the Audi A8's time now? From its 1994 launch to the latest fourth generation, there are many reasons why the limo from Ingolstadt has been ahead of the curve. But despite its pioneering aluminium architecture, its starring role in Ronin and now its embrace of autonomous driving, it feels like the A8 has never quite won the plaudits its technology deserved. Over the next half year we'll test its Vorsprung durch Technik to the max. And there's an awful lot of tech to get our heads around; the manual stretches to 356 pages. 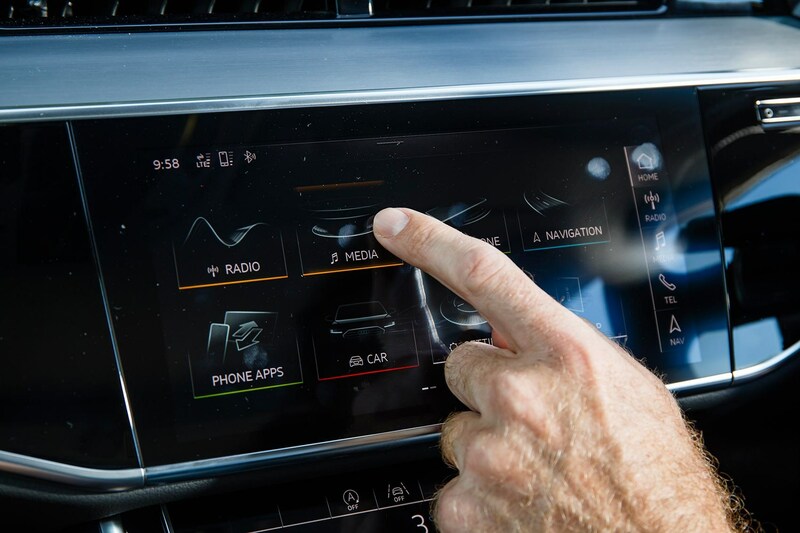 Our car has done away with most buttons, replaced with a haptic touchscreen. Laser lights strobe through the darkness like something from a Jean-Michel Jarre lightshow. Add in four-wheel steering, 48-volt mild-hybrid creds and an array of semi-autonomous systems and it's easy to make a case for the A8 being one of the most technologically advanced cars on sale today. Will we be able to master the machine? Will we applaud this technological marvel, or wish it was a little bit simpler? The CAR long-term test should uncover the truth, warts 'n' all. We've picked an A8L 50 TDI Quattro 286ps Tiptronic finished in classy, subdued Navarra Blue metallic. The 'L' denotes an extra 13cm of wheelbase, creating an echoing rear passenger compartment. Audi UK says around 80 per cent of buyers pick the stretched model. 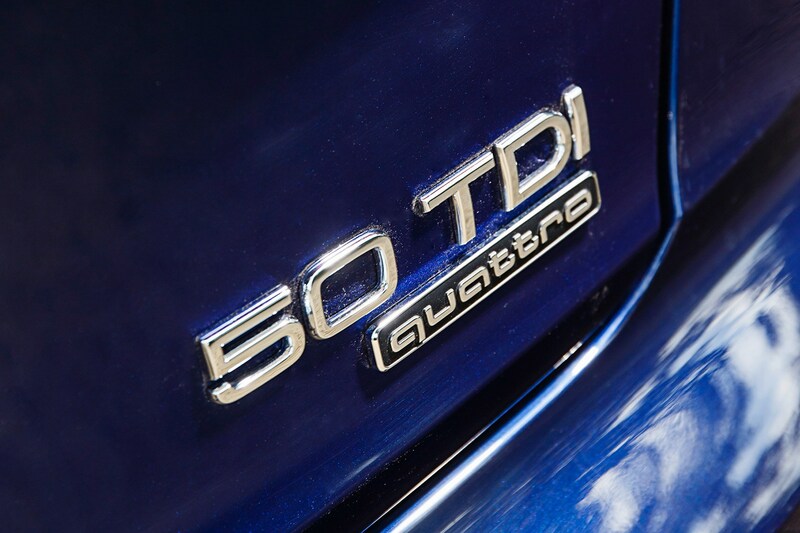 The '50 TDI' bit still confuses us, frankly. To mask the downsizing revolution, Ingolstadt has dropped engine capacities for power bands – 50, which is towards the top of the scale, reflects our car's 282bhp output. At the bottom of the scale, the entry-level A1's 25 TFSI badging conceals a more humble 94bhp. The system will apply to future electric models as well as petrol, diesel and hybrid Audis, although exception will be made for hot S or RS models. 'Quattro' in the name says that all four wheels are driven, although there's nothing to say that each axle steers, too. 'Tiptronic' reflects the standard eight-speed automatic transmission. What's left for the driver to do, apart from browse the internet and chat away to the supposedly more natural voice recognition? The price of all this progress is a punchy £72k for the base car, on a par with a similarly specced BMW 730Ld xDrive. But ours is one extravagantly specced A8, featuring a cornucopia of extras that add £21k to the price. 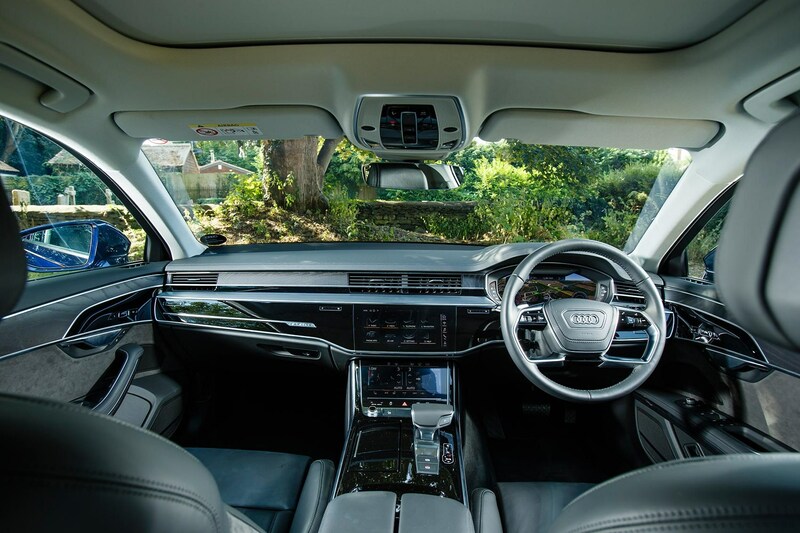 So step in, relax and join us throughout the rest of 2018 as we find out if the A8's undoubted technical wizardry exists to treat or taunt us.